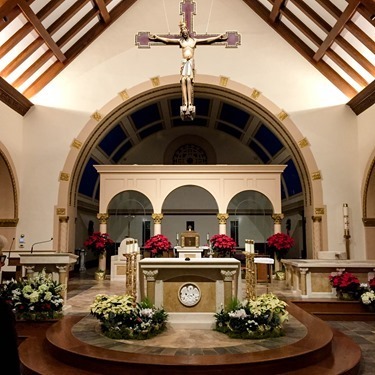 St. Mary's opened the doors to their newly renovated Church December 12th, 2015. 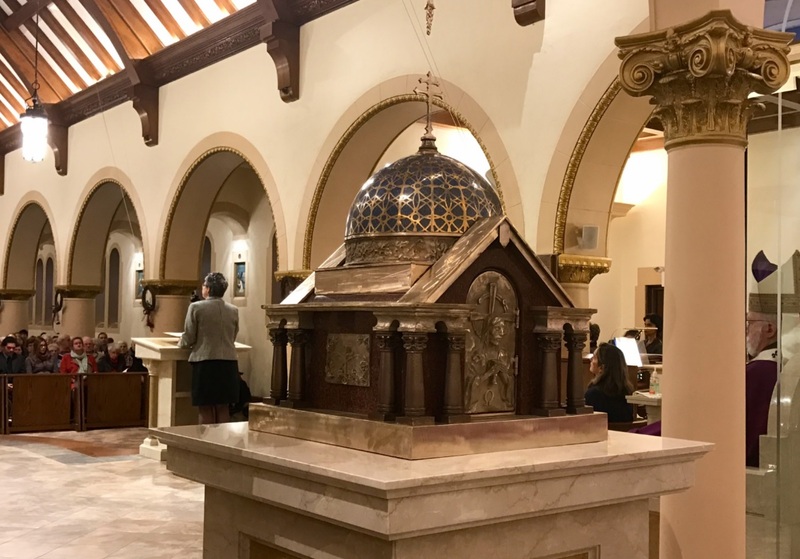 Their renovation goal was to provide a more welcoming environment, improve accessibility and provide a richer experience of worship for generations to come. 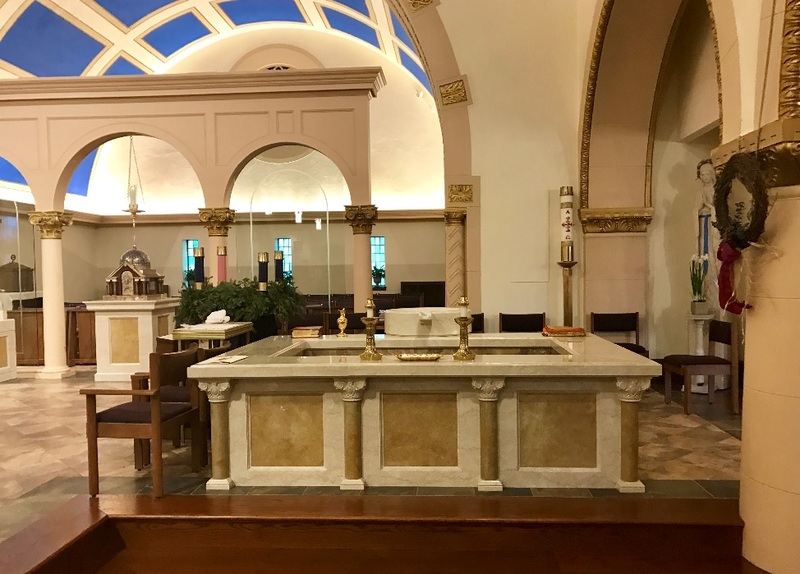 While the finishing touches are still underway, St. Mary’s has provided new handicap accessible entrances, walkways and ramps, more wheelchair seating and improved access to the altar. There is also a new gathering space with glass doors at the main entrance, a new reconciliation room, a dedicated meeting space and new kitchen and storage space. As part of the remodelling, with only street parking available in the past, St. Mary’s has created a new parking lot. It now has 36 new spaces not including 4 handicap spots giving a total of 40 new parking spaces. 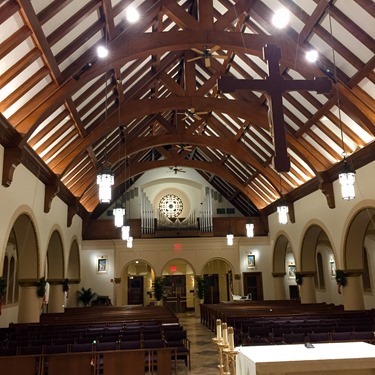 Although we remain hopeful that last winter’s snowfall counts will not repeat at least St. Mary’s will be ready to accommodate parishioners in the months and years ahead. 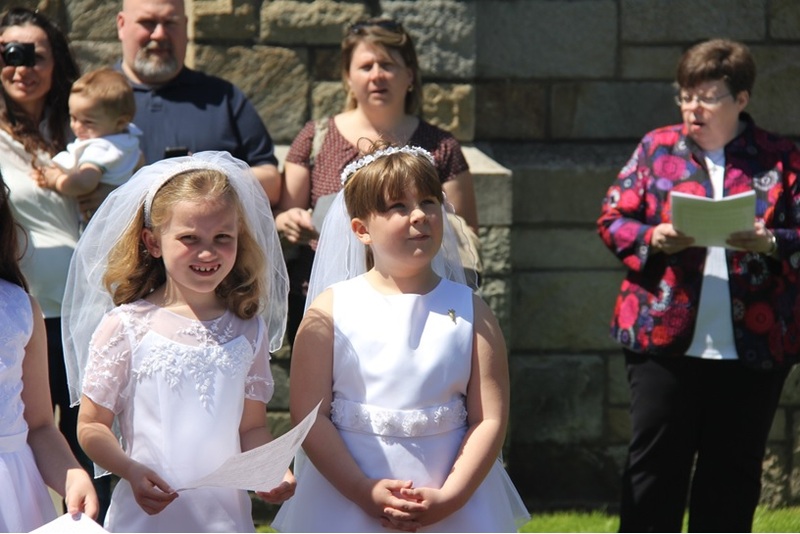 Starting on the first weekend of July until the end of the renovation we will be holding weekend Masses at St. Mary’s school on 14 Otis Street in Danvers. Most of you are aware of our parish’s plans for the construction of a new parking lot on the site of the former Mackey Funeral Home. 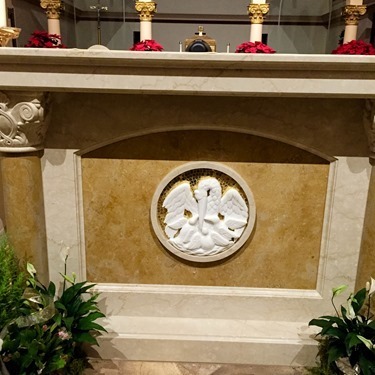 This project is part of our St. Mary’s 2015 initiative, which seeks to upgrade our parish facilities by improving ease of access and renovating our worship space in order to promote greater participation for you, the faithful, while enhancing existing aesthetics. I am aware that there are some who do not support the demolition of the Mackey Funeral home or the expenditure of significant monies for the acquisition of a parking facility. This decision was made with the full support of the Parish Pastoral Council and the Parish Finance Council with the recognition that this is a once in a generation or perhaps even once in two generation opportunity to secure parking for the parish and improve our ability to be a hospitable and welcoming faith community. Hospitality is extolled greatly as a virtue in the scripture and while providing parking might not give us the “warm fuzzies” that we get from more personal acts of hospitality, dedicated parking is nonetheless an essential component for any organization or business that seeks long term sustainability and viability. One of the primary reasons that the Mackey Funeral Home became available for purchase was precisely its lack of adequate parking, and if you would like confirmation that parking does indeed make a difference for a business or organization, you might simply ask Mr. Dan Mackey about this question. It was our sincere hope that someone would have interest in relocation of the building given a potential zero acquisition cost had they agreed to relocate it. It certainly did not help that some preservationists seemed unwilling to seriously consider relocation because of their determination to maintain what I would contend is a nonexistent “streetscape” as it were. I do feel that this would have constituted an authentic compromise while the proposal that the parish preserve the original front portion of the building while demolishing only the later addition to attain an unconfirmed 20 parking spaces is a pseudo compromise, since in effect, preservationists achieve the ideal state of affairs of not only keeping the building in its original location, but also having the owner restore it to its original footprint while eliminating what is no doubt a less desirable accretion from their perspective. 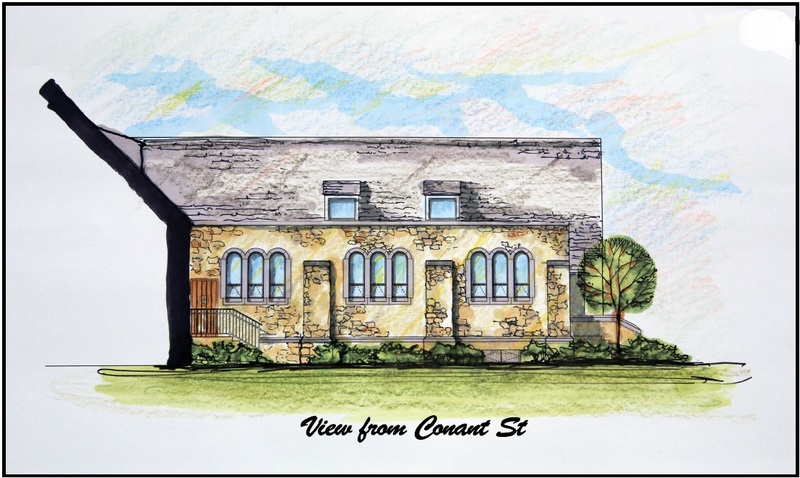 The prospective demolition of the former Mackey Funeral Home is regrettable but I have no doubt that Elias and Edie Mackey will be smiling from their places in heaven when they see parishioners making their way from their former property to their former spiritual home at St. Mary’s. They truly were that dedicated to our faith community and this is as much about them than it is about anyone else. The following statement has been released recently regarding the Mackey Funeral Home property at 22 Conant Street. To be clear, our first preference is to facilitate the relocation of the building by a party who would acquire the building. We are advertising the building’s availability for this purpose. 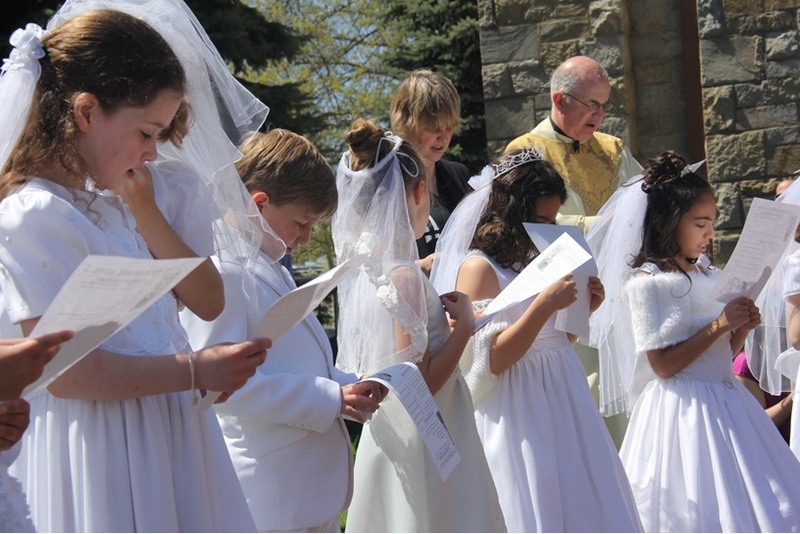 St. Mary’s Parish is a vibrant parish and actively engaged in addressing the needs, spiritual and temporal, of our parish community. A recurring concern is the need to provide access and parking for our families and particularly for our senior parishioners. 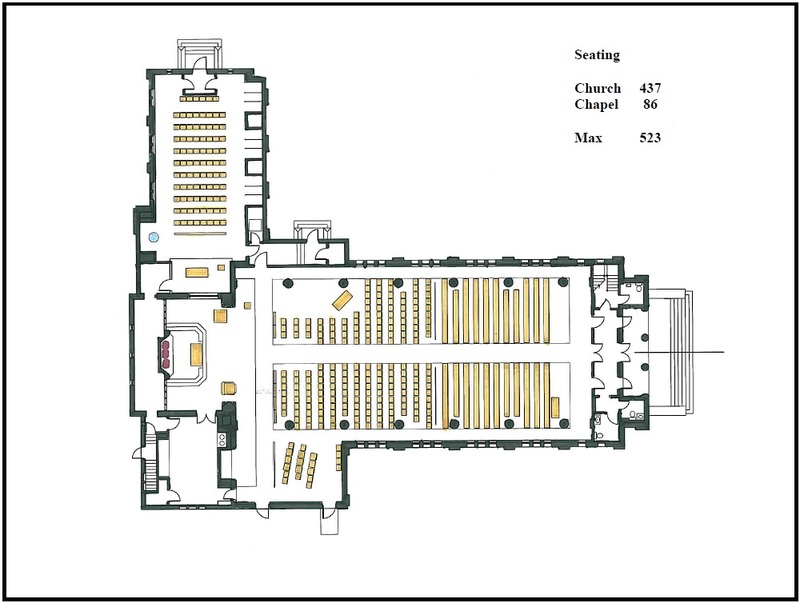 A Feasibility and Planning Committee in collaboration with the Pastor and the Parish Pastoral Council and Parish Finance Council has been engaged in the effort to address these needs, and, over the past several years, has developed a plan to renovate the church building itself and, to provide among other things, better handicapped access, a more welcoming environment and a parking facility. Street parking, particularly within reasonable walking distance for our elderly, is limited, even more so at this time of the year with snow piling up. Expecting our parishioners to park in the private lots of downtown commercial businesses is not an appropriate answer to our parking needs. The Mackey Funeral Home at 22 Conant Street immediately abuts St. Mary’s Parish. 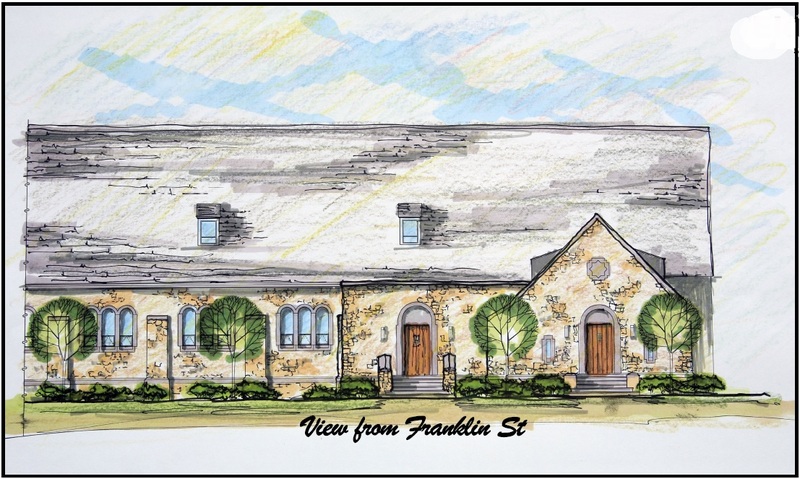 When the funeral home property became available for purchase about a year ago, the parish negotiated a fair market purchase price to acquire this property for the purpose of construction of a much needed parking lot. This decision, made by the Parish Leadership (The Pastor and the Parish Pastoral Council and the Parish Finance Council), and approved by the Archdiocese, will address the very real needs of the Parish to provide safe, accessible parking for its parishioners, particularly its seniors. We have proceeded through the planning and permitting process exactly in accordance with the Town’s Bylaws; in total, we have had 5 publicly noticed meetings. 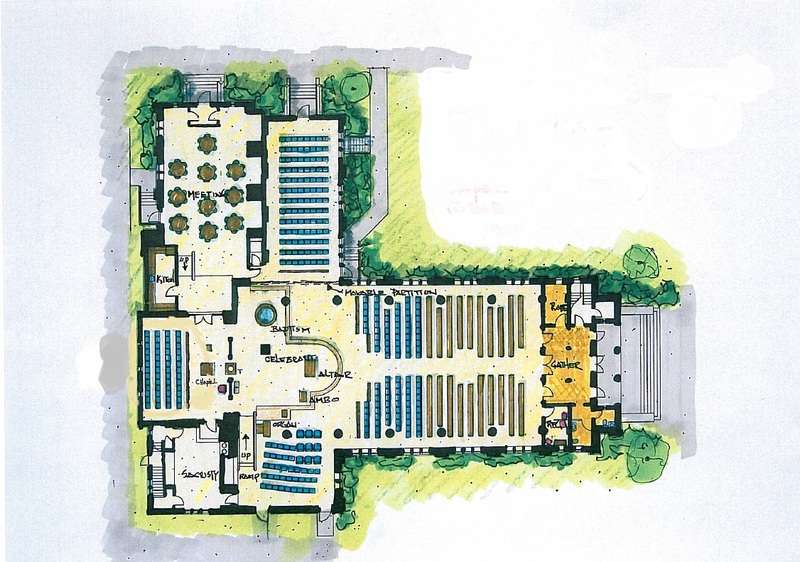 Through that permitting process we have received all permits for both the renovations to the church building and the construction of the parking lot through the Zoning Board of Appeals and the Planning Board. As was anticipated, under the Demolition Delay Bylaw, the Preservation Commission imposed a 6-month delay in the demolition of the building at 22 Conant Street. In the spirit of the Demolition Delay Bylaw, during this delay period, we are pursuing various options for relocation and preservation of the building, including donation of the building for housing by a non-profit entity. 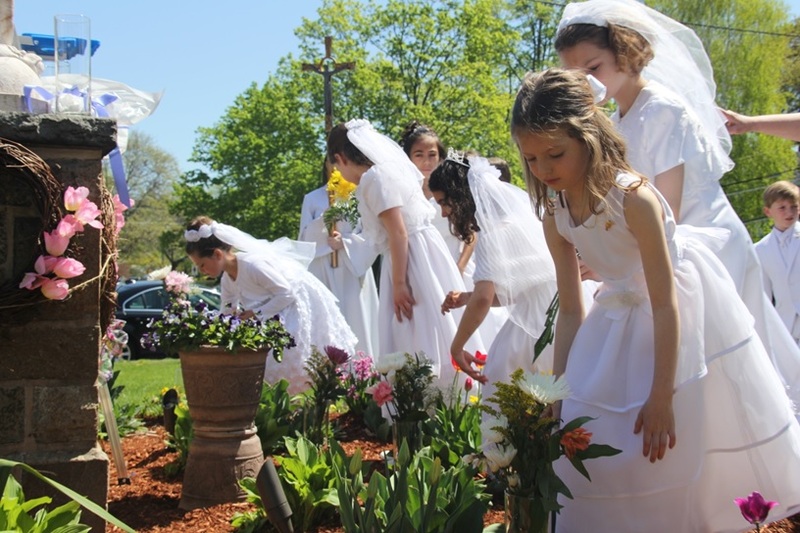 St. Mary’s through its own initiative, and working with the Town of Danvers and others, is actively seeking to find a party interested in relocating the funeral home building, preferably within the Town. Please be aware that our Chapel is closed for renovation. 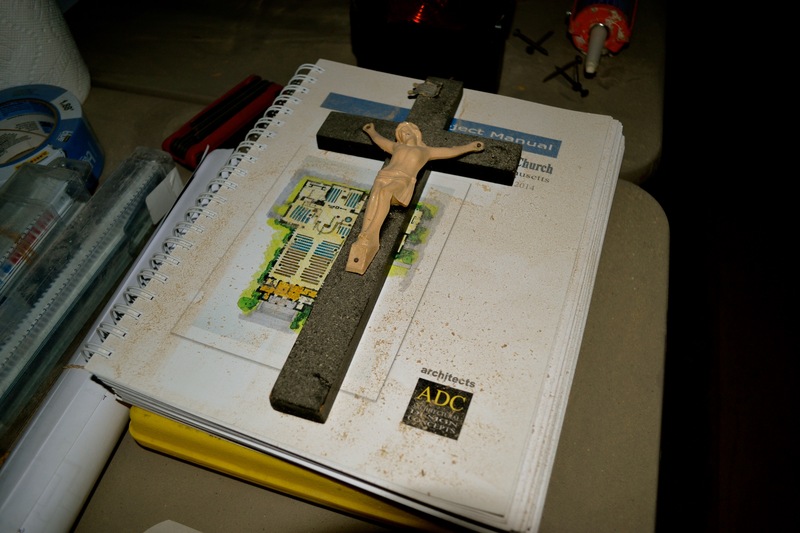 For safety and liability reasons we ask that no one enter the Chapel during the renovation time. Hospitality that was previously held in the Chapel is now held in the lower rectory at this time. Contractors have begun work on the renovation of the Church. The project will be “phased” in a way that will enable us to continue using the Church through Lent and the Easter Season before we leave the building in early June. Between now and then, all weekday Masses will take place in the Church as the contractors will be working in the present chapel. At this point, we are anticipating that the project will be complete sometime in October. We ask for your patience and understanding as we begin this journey to greatly enrich our life as a community of faith. Please pray for our parish during this important time of transition. As you may have read about in past bulletins, the Danvers Herald or heard in passing, our Church is undergoing a renovation project. This project is coupled with plans for a new parking lot which will be located on the current site of the Mackey Funeral Home on Conant Street. These two elements comprise a single “site plan” that has been approved by the Town of Danvers Planning Board. To help answer your questions about the details of this project and how it will affect us and our life as a worshipping community updated information will be posted to this “Renovation Update’ webpage. Please be aware that some of the answers to your questions are now becoming clearer, and others are yet to be determined. We invite you to visit this page from time to time to check the progress of our renovation project and find information to help address your questions and concerns.